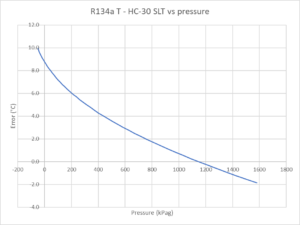 This article is a limited comparison of the R134a and HC-30 from the point of view of pressure temperature behavior as it impact practical implementation and measurement. Exploring HyChill Minus 30 laid down the basis of a CoolProp model of HC-30 for comparison with CoolProp model of R134a. 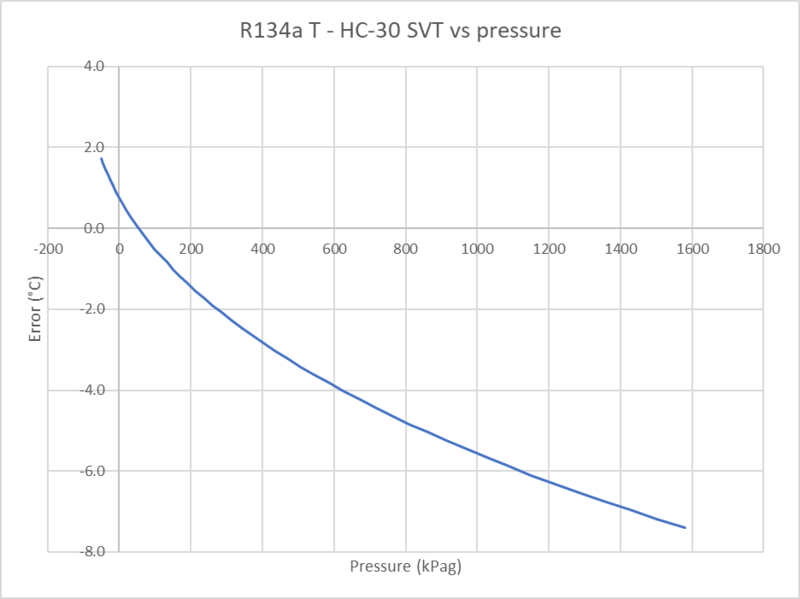 Above is a comparison of the pressure/temperature of HC-30 and R134a over the range of interest in a vehicle aircon. The typical high and low side HC-30 operating pressure bands are shaded. 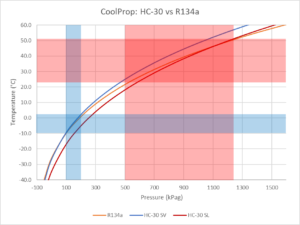 Lets discuss methods of using existing instrumentation that has R134a scales with HC-30. They are different enough to require correction in some circumstances. Subcooling might be the optimisation target for a refrigeration system using a non-fixed restrictor, such as a thermostatic expansion valve (TXV). The characteristic of HC-30 may not be known by the instrumentation being used, but R134a may be and can be used with a correction. 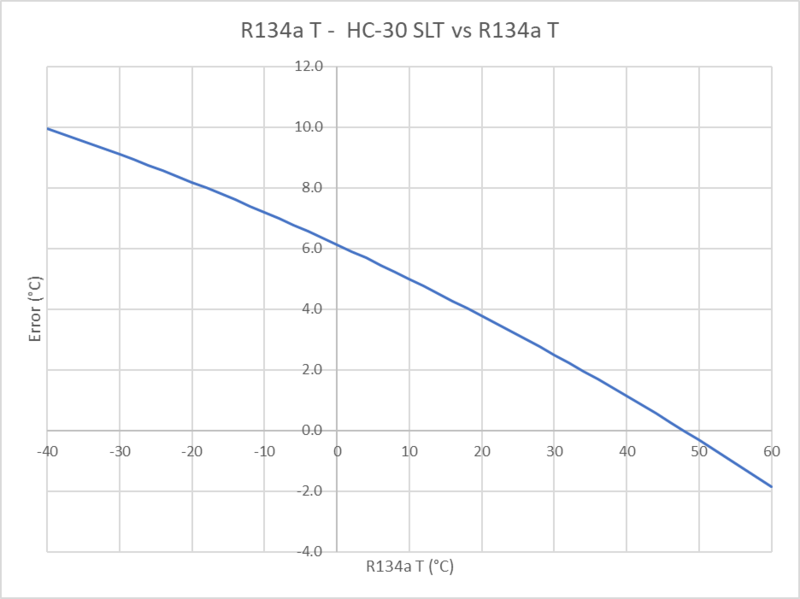 In the case of HC-30 subcooling, we are interested in the SLT implied by the high side gauge compared to a measurement of the liquid line temperature (the difference being the subcooling). Above, the error between R134a indicated temperature and HC-30 SLT. It ranges from about 3.5° @ 30° down to 0° at 55° (typical high side temperatures). 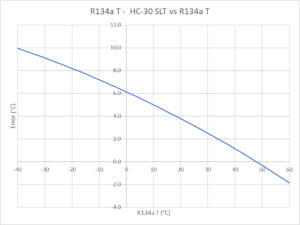 The gauge indicated R134a temperature can be corrected to HC-30 SLT by subtracting the error from the graph above. 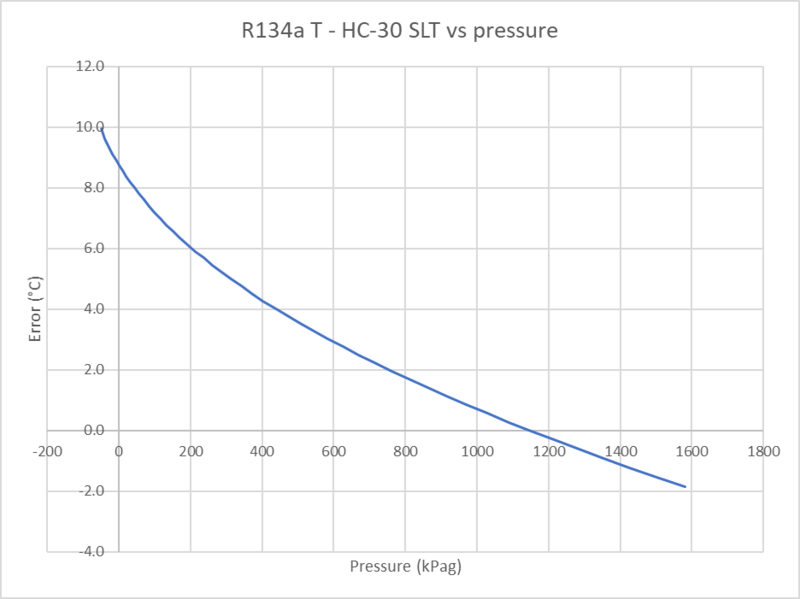 The error between R134a indicated temperature and HC-30 SLT (and calculated subcooling) is shown above against gauge pressure as that will often be simultaneously visible on A digital display (eg when displaying subcooling). Superheat might be the optimisation target for a refrigeration system using a fixed restrictor, such as a capillary tube or orifice tube. 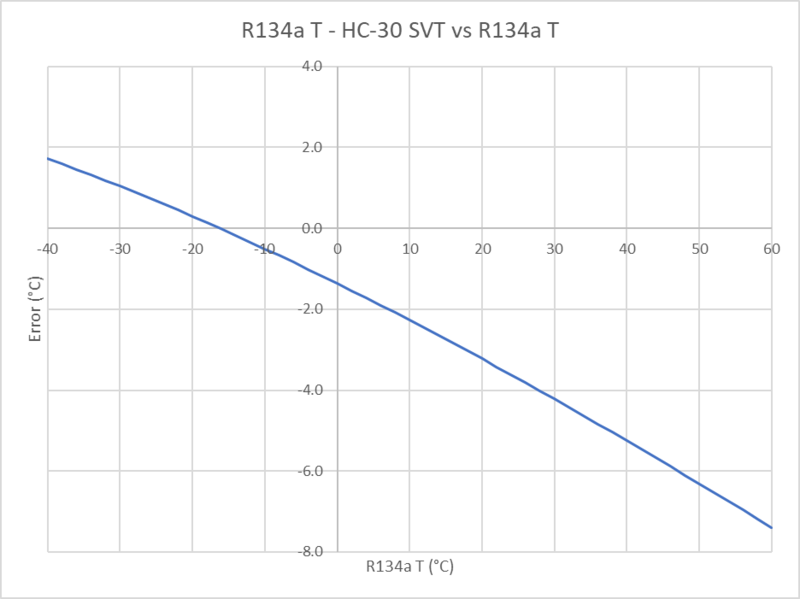 In the case of HC-30 evaporator superheat, we are interested in the SVT implied by the low side gauge compared to a measurement of the evaporator outlet temperature (the difference being the superheat). Above, the error between R134a indicated temperature and HC-30 SVT. It ranges from about 0° @ -16° down to -2.3° at 10° (typical low side temperatures). 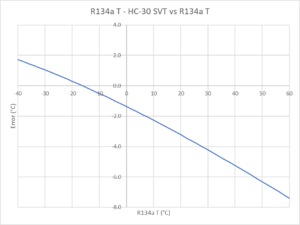 The gauge indicated R134a temperature can be corrected to HC-30 SVT by subtracting the error from the graph above. 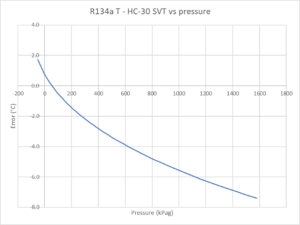 The error between R134a indicated temperature and HC-30 SVT (and calculated superheat) is shown above against gauge pressure as that will often be simultaneously visible on a digital display (eg when displaying subcooling).